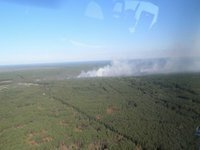 As many as 12,000 people have already been evacuated due to a fire and explosions at an ammunition depot near the village of Druzhba of Ichnia district in Ukraine's Chernihiv region, the Ukrainian State Emergency Situations Service has said. "Thirty-five buses are being used to evacuate people. Nearly 12,000 have already been evacuated. No fatalities or injuries have been reported," the service said in a report, which includes data received as of 09:30 a.m. local time. Earlier reports put the number of evacuees at 10,000. The evacuation is ongoing in 31 towns and villages of Ichnia district, including the administrative center of Ichnia and Druzhba village, and also in seven populated localities in Pryluky district. Eighteen reception centers for evacuated people have been deployed in the region.